Doyle’s blackberry, or Rubus sp., plants produce semi-erect, thick, thornless canes. The plants grow up to 20 feet long and arch down to the ground if they are not trained on a trellis. The fairly firm fruit is small to medium sized with large seeds and a poor to fair flavor. The plants grow best on a sunny slope, planted 4 to 5 feet apart in rows 10 feet apart. Raspberry bush dwarf vrus, or RBDV, affects Doyle’s blackberry plants and spreads during bloom season. 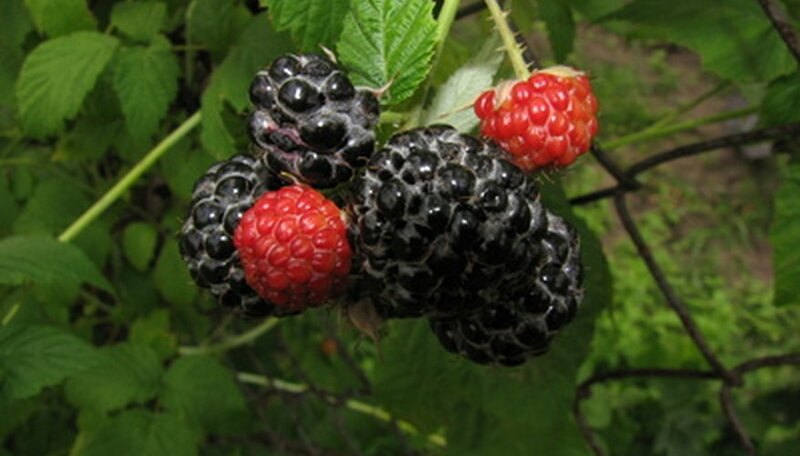 Infected blackberry plants may not show any symptoms or the plants may have yellow leaves and small deformed fruits. Impatiens necrotic spot virus, or INSV, is transmitted by thrips and causes the stunted growth on Doyle’s blackberry plants. Symptoms on the foliage include yellow or dead spots, ringspots, mosaic, mottling, lined patterns and dead leaf veins. Tomato ringspot virus, or TOTSV, and tobacco ringspot virus, or TRSV, are the most widespread diseases on Doyle’s blackberry plants. The diseases are spread by dagger nematodes and cause stunted growth and dwarfed branching. Other symptoms include dead spots, ringspots, mosaic, mottling and yellowing of foliage. To reduce the incidence of viral diseases, plant disease-resistant varieties of Doyle’s blackberry plants, remove weeds and wild bramble plants from nearby areas, and apply pesticides approved for insects on blackberry plants to reduce the spread of diseases. Fungal diseases are common on Doyle’s blackberries in cool, damp weather. Powdery mildew forms a dusty white or gray coating on the leaves, petioles, flowers and fruit of infected plants. Gray mold caused by the Botrytis fungus develops into a thick, fuzzy growth on infected fruit and canes. Blackberry plants infected with orange rust are stunted and weak, and produce little or no fruit. To prevent fungal diseases, space plants far enough apart for good air circulation, support the canes on trellises and apply fungicides approved for blackberry plants. Hot, sunny weather in the fall can cause Doyle’s blackberry plants to produce small white drupelets, or fruits, which are probably the result of heat or sunburn. There is no chemical or cultural control for white drupelets. Crumbly fruits that fall apart when picked or handled are the result of poor pollination or weak plants. Proper fertilization and irrigation, and treatment of diseases and pests, reduce the probability of crumbly fruits. Two-spotted spider mites are serious pests of Doyle’s blackberry plants. Other pests are aphids, Japanese beetles, potato leafhoppers and tarnished plant bugs. Pesticides for insects on blackberry plants can be used to control pests.